BREAKING: Black woman blamed for actions of thousands of others. Following the loss of Democratic candidate Beto O’Rourke to Republican incumbent Ted Cruz in the 2018 Texas U.S. Senate race, fans are shifting blame to singer Beyoncé. The “Apesh**t” singer, a Houston, Texas native, took to Instagram on Election Day, Tuesday, November 6th, to post a series of photos and videos endorsing O’Rourke. In them, Bey is rocking a “Beto for Senate” hat. O’Rourke was up against Cruz for the Senate race, but, in a narrow win, Cruz gripped the re-election yesterday. O’Rourke has served as U.S. Representative for Texas’ 16th congressional district since 2013. Given CNN‘s exit poll for the race in Texas, shifting blame to Beyoncé is certainly a strange flex. 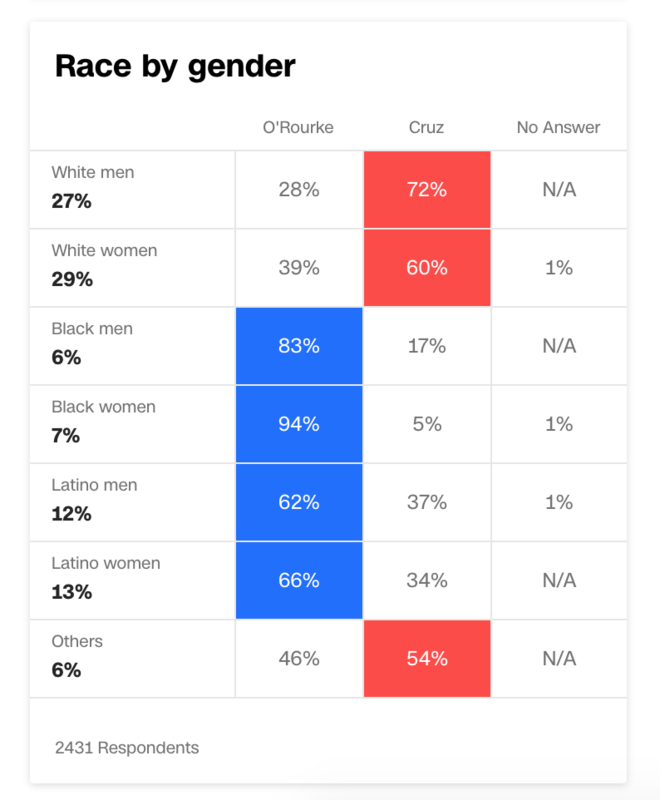 White men and women mostly voted for Cruz, while Black and Latino men and women rallied for O’Rourke. But sure. Let’s blame Beyoncé.